Custom Wine Glasses – Many Styles of Custom Wine Glasses Available! Our Custom Imprinted Wine Glass Collection is perfect for bars, restaurants, clubs, fraternities/sororities, promotions, and much more. You can choose from a dozen different Custom Wine Glass styles, ranging in size from 6-1/2 ounces to 20 ounces. 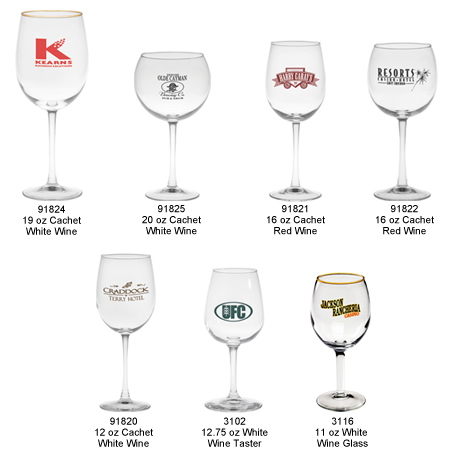 Pricing for Custom Wine Glasses – Call 1-800-233-0828 for more info or to order! 91824 19 oz Cachet White Wine $3.90 $3.49 $3.34 $3.24 $3.14 $2.93 2" 2-1/2"
91825 20 oz Cachet White Wine $3.90 $3.49 $3.34 $3.24 $3.14 $2.93 1-1/4" 3"
91821 16 oz Cachet Red Wine $3.90 $3.49 $3.34 $3.24 $3.14 $2.93 1-1/2" 2-3/4"
91822 16 oz Cachet Red Wine $3.90 $3.49 $3.34 $3.24 $3.14 $2.93 1" 3"
91820 12 oz Cachet White Wine $3.90 $3.49 $3.34 $3.24 $3.14 $2.93 1-1/2" 2-1/4"
3102 12.75 oz Wine Taster $3.59 $3.19 $3.06 $2.96 $2.87 $2.67 1-1/2" 2-1/4"
3116 11 oz White Wine Glass $2.81 $2.45 $2.35 $2.28 $2.21 $2.06 1-1/4" 2-7/8"
It's easy to have your own Custom Imprinted Wine Glasses. Simply call 1-800-233-0828 and submit your camera-ready artwork to graphics@kardwell.com (you can also mail your art). The minimum order is just 72 Glasses and Process time is about 3 to 4 weeks. Rush delivery is available.